Ever wonder what put the dot in the .com boom? Greed, guys. Nothing but pure and unadulterated human greed, according to actor/monologist Michael Daisey, who bears the scars of first-hand encounter. 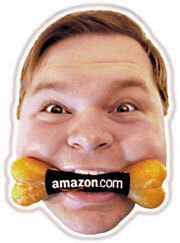 Daisey is a funny man and his 21 Dog Years: Doing Time @ Amazon.com is a very funny show. This little offering premiered in Seattle and went on to off-Broadway and beyond. Until he gets out, Daisey defines the dot.com sellout but, to tell the truth, he only did it for the insurance &#150; at least in the beginning. Temps don&#146;t get insurance but permanent employees do, so our hero, armed only with a Bachelor&#146;s degree in aesthetics, enters the hallowed halls of Amazon.com &#150; where employees bring their dogs to work and let them run free. Eventually, the animals coalesce into packs, which could be a nice metaphor for what happens to the humans as well. As an entry level customer service rep, Daisey lives life in a cubicle, where every move he makes, every call he answers is noted on his productivity chart. Eventually, the scrutiny gets to be too much for our hero so he interviews for a better position. He still possesses no skills whatsoever but that doesn&#146;t seem to be a problem in a world that simply requires you to keep talking and look busy. To his astonishment, he gets the job and starts making some real money for the first time in his life. Even better, he gets stock options. He doesn&#146;t really do anything, mind you, but neither does anybody else. Between playing video games, reading the Wall Street Journal and sucking down innumerable lattes, they all manage to get through the day. Finally, Daisey can&#146;t stand it anymore because &#147;Free bagels and shiatsu massages don&#146;t really constitute a belief system.&#148; To the horror of everybody who knows him, he takes all the money he&#146;s made and Jean-Michele and heads off to Spain, where laziness has been raised to an art form. He feels right at home there. Mike Daisey is one of the lucky ones. No, he never got to cash in those options to become an instant millionaire but he got out of the dot.com business before the business got him. Along the rocky road, somebody must have said to him &#147;You&#146;ll laugh about this someday.&#148; And they were right. Thanks for sharing, Mike. We&#146;re laughing right along with you.